When Phyllis Hoffman DePiano "knocked on our door" at DaVinci Roofscapes, we eagerly opened that door. DePiano, Chairman of the Board and CEO for Hoffman Media, oversees the operations of many popular magazines, including Southern Home, Cottage Journal, Southern Lady Holiday, Victoria and Taste of the South. Her call to us was to partner up on a renovation project of an outdated 1970s "modern" home … upgrading it to a traditional English style home. Later this year several of the magazines in the Hoffman Media family will feature in-depth stories on the transformation of this home … but we're giving you a sneak peak at the exterior progress. The stunning stone facade and wood accent home exterior is now being topped with a Bellaforté Slate roof in Smokey Gray-VariBlend. "We wanted a durable, yet aesthetically-pleasing roof on this mountain house," says DePiano. "There are so many aspects that make the DaVinci product ideal for this English Country Manor Home. 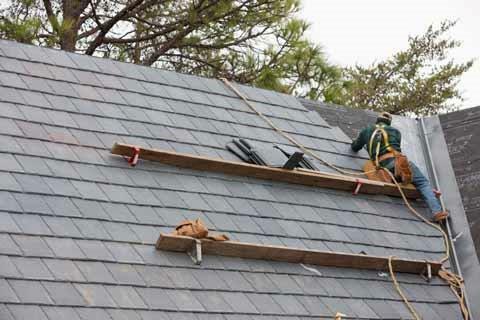 The synthetic slate tiles are impact- and fire-resistant, plus they'll require no long-term maintenance. But, most importantly, they so closely resemble natural slate that they perfectly complement the style of this home." DePiano says the intent of the project is to create a new energy efficient home that has the look of a home hundreds of years old — but with advancements only available in today's marketplace. "Imagine the tremendous weight of a natural slate roof plus all the time and hassles it takes to install one," says DePiano. "The DaVinci faux slate roof is lightweight, easy to install and has all the appeal of natural slate. We picked a winner!" Watch for the story on the entire home reconstruction in an upcoming issue of Southern Home magazine … and we'll share more story highlights with you soon.